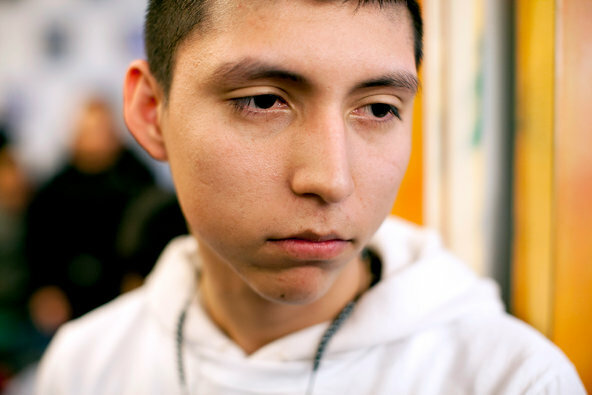 Antonio Alarcon, an undocumented immigrant from Mexico, watched President Obama’s immigration speech on Jan. 29. As expected, the media has begun their sob movement intended to tug at our heartstrings. Could they have possibly posted a more heart-wrenching photo to illustrate the "face" of illegal immigration? Deport the Alarcon crook, Obama! Looks like a typical braindead thug to me. What happened to the days when our leaders expressed consternation at opening up our borders to the mentally defective? Aww, how sad....a heavy-lidded, sullen-faced teenager. Don't all teens look like that? This is so incredibly transparent. I watched some of Obama's speech on CNN. They had a reporter interviewing a large group of Hispanics, many whom were Dreamies, as they watched him on TV. Unlike this guy, they were all elated and cheering while listening to Obama promise legalization and a path to citizenship. So, why on earth would this guy look so pitiful in reaction to his speech? He looks like he just lost his best friend. This is exactly the type of deceptive tactics we can expect in the coming weeks and months from the pro-amnesty movement. They always try to use kids to get remorse. If they broke the law deport them. American kids get punished all the time for breaking laws. After Mexico, El Salvador, Guatemala and Honduras are the countries of origin of the largest numbers of unauthorized immigrants, with more than 1.5 million combined, according to the Homeland Security figures. Next are four Asian countries — China, the Philippines, India and South Korea — which accounted for a little more than 1 million between them. I never hear about Asian illegals. Are they purposely not targeted by the media. There's plenty of them, they just don't have their own lobbying group. At least not one as loud as La Raza.